Senior Labour figures have strongly criticised a frontrunner in the race to take over as their leader in Wales for embracing a policy which was launched in Scotland long ago, it has emerged. One told The Eye that Mark Drakeford was an “opportunist” for placing the ‘baby bundle’ or ‘baby box’ at the heart of his campaign, while another said it was “crass”. The baby box started to be rolled out in Scotland on August 15 after an initial trial and is sent directly to home addresses after registration with a midwife. It includes essential items for a child’s first weeks and months to support mothers and fathers. He was pressed by the Western Mail about the fact he was copying the idea from the SNP Government in Scotland. But Professor Drakeford stressed: “I have never believed that devolution is about an inward-looking idea in which we fend off things that happen elsewhere”. Yet his move was criticised by politicians in his own party. One Labour figure said to us: “This is clearly an opportunist move when the policy was first introduced somewhere else”. Another said: “I simply can’t understand it, this is a transparent, crass thing to do”. The mainstream media said Professor Drakeford ‘launched’ the idea at the Little Inspirations Day Nursery in Rhydyfelin, Pontypridd. Apparently ignoring the fact the baby box had already been up and running in another part of the UK, he said in a speech: “Investing in a child’s life at the very beginning… is absolutely in that preventative strand of thinking which we’re determined to try to do more of in Wales”. He was at the helm as Welsh health minister when a scandal erupted at a North Wales hospital about the treatment of mentally ill patients, which hit the UK media. Tawel Fan at Ysbyty Clwyd was closed in December 2013 after shocking revelations were made by The Daiy Mail. Patients were ‘treated like animals’ as they were filmed crawling across floors, and a report into the scandal in 2015 said there was “institutional abuse”. Professor Drakeford, now the Welsh Government Cabinet Secretary for Finance and Local Government, apologised and said there would be an “urgent meeting”. 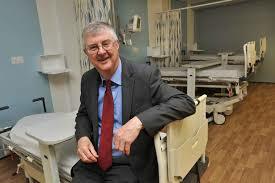 Yet it would appear that questions about the treatment of patients in the Welsh NHS have persistently dogged Professor Drakeford’s time as health minister in Wales, although this has not hindered him being touted as the next person who may now become Welsh first minister. The Eye were given exclusive details by whistleblowers who had worked at Brecon War Memorial Hospital of how an elderly stroke victim was allegedly slapped in bed by a carer, and visiting families were forced to bring in food to keep their starving relatives alive. We have also been told that falsification of notes at the hospital was “routine practice”. One whistleblower said: “The night culture at Brecon hospital is amateur at best, dangerous at worst. “(Staff were) drunk on duty, nurses (were) put to bed as they were drunk, then woken up before days-staff turned up. A police investigation followed which lasted several months. The disturbing news of the events at the Brecon hospital came hard on the heels of earlier scandals, also on Professor Drakeford’s watch as Welsh health minister. At Ysbyty Cwm Cynon in Mountain Ash, 10 hospital workers were suspended following the death of an elderly woman who was found with “unexplained and serious injuries” on a ward. Meanwhile nurses at a hospital in Bridgend were investigated by police for allegedly drugging elderly and difficult patients to enjoy a quiet night shift. One nurse blew the whistle on what was happening before the death of an 82 year old woman, Lillian Willams, at the town’s Princess of Wales hospital. She had one of her legs amputated but died in 2013 after a catalogue of neglect at the hospital, which is part of the Abertawe Bro Morgannwg University (ABMU) health board. In total two deaths at the Princess of Wales hospital, occurred after a review recommended changes in practices which should have ensured “patient safety”. Yet this is not the only time Professor Drakeford has made made headlines for the wrong reasons. One of his supporters became embroiled in the anti-Semitism row which has engulfed the Labour party. Darren Williams was a major backer of Professor Drakeford’s on Labour’s National Executive Committee (NEC) who jointly-founded Welsh Labour Grassroots, which served as Wales’ branch of the Jeremy Corbyn-backing Momentum group. A contentious tweet that was ‘liked’ by Mr Williams read: “There are conspiracies by Jews – one of them being the #GnasherJew site – there are conspiracies in all walks of life – I believe #GnasherJew is causing a lot of grief for decent Jews in Britain who don’t like fanaticism – so counter-productive”. But Mr Williams emphasised his support for Professor Drakeford, saying: “Thanks in large part to Mark’s (Professor Drakeford’s) clear-sightedness… Wales has been spared the financially-ruinous PFI (Private Finance Initiative and) our NHS has been protected”. As Welsh Health Minister, he added, Professor Drakeford had ‘skilfully’ defended the ‘achievements’ from “the malicious propaganda of (former Prime Minister David) Cameron and (former Health Secretary Jeremy) Hunt”. In a statement, Mr Williams defended himself against accusations of anti-Semitism, adding that he feared “certain individuals” misuse accusations of anti-Semitism to target “those who are merely voicing legitimate criticisms of the Israeli state”. Yet Professor Drakeford appears unconcerned at having a supporter with accusations such as this in the background. It seems Labour’s apparent lurch to the left is still making UK headlines and Momentum is at the heart. Only yesterday The Daily Telegraph reported that a new draft clause had been circulated to senior Labour figures making a future acting leader answerable to the NEC. Critics believe it undermines the authority of the present Deputy Leader, Tom Watson. The nine permanent members of the NEC are staunch supporters of Mr Corbyn’s, who were recently elected on a Momentum-backed slate known as the ‘JC9’. A democratic election for the Labour leadership in Wales through OMOV (One Member One Vote) cannot hide this record. Professor Drakeford’s past statements too have been questioned. Early on he categorically ruled out running to take over from Carwyn Jones. He said: “I’ve no ambitions in politics at all. Do I want to be First Minister? No, I don’t. Am I ambitious to be First Minister? No, I’m not”. It seems Professor Drakeford IS now ambitious to be First Minister and the ‘baby box’ is part of the campaign.